May you be blessed.... An inspiration found in my email this morning. My prayer for you. 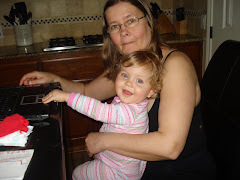 Happy First Birthday to my granddaughter Mahala. 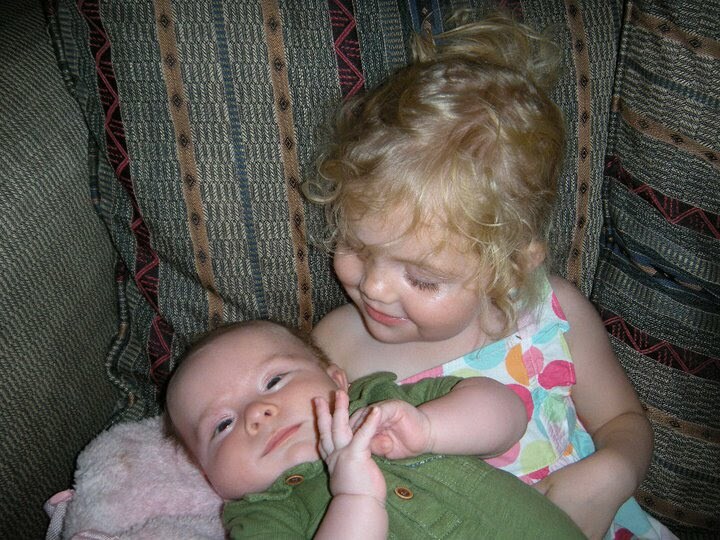 Last July 22, 2009 we found out she was a miracle. Click the link to read about the miracle. But not just one miracle, but two. Kristy went into septic shock a couple of weeks later and spent days in the ICU due to complications of her ruptured uterus. 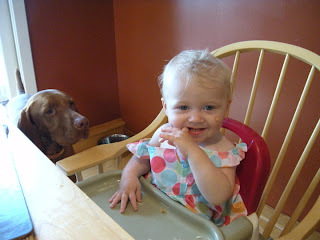 But it is now a distant memory, but today I thank God once again for the miracles saving my daughter and granddaughter. Detamara asks "Why do I belly flop?" I snapped this picture to explain to my visual learner. Her response... I look like I am flying! Mom's response, "You need to keep your legs together and not fly or you splat!". We are enjoying our hot summer and the pool is perfect for Becca at 85 degrees without a heater. 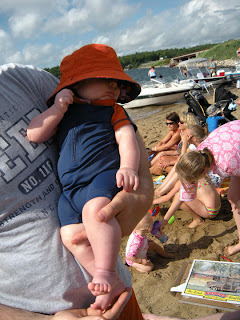 Much better than last summer as we barely swam as it was way too cold. After.... and $4600.00 later. Doing some of the work ourselves we saved over $1500.00 on installation by pumping out and removing the liner ourselves. I spent Saturday using my new favorite household gadget, a Pressure Washer. I washed the old concrete and cleaned up the deck to spruce up the pool area to match the new liner and it is amazing how good it all looks. Along with getting 150 to 200 kids ready for school through our Backpacks for Kids project, I have to think about what we need at home as I am a homeschooling mom. This year we have the privilege of doing child care for Serena everyday after school. Becca has a job and I get to teach. I am a fan of the Dollar Spot at Target and found it stocked for back-to-school and bought $1 items that will be used homeschooling my two girls and teaching Serena. Alphabet stickers, 5 pack of Praise stamps, workbooks, and Early reading books Levels 1, 2 and 3 (Books like this can cost $5.95) and my best find $1 Teacher Planner (bought 2 one for this year and one for next). Days of the week notes, Things to do lists (I use these each day with my girls so they can check off their work both school and chores), and a bunch of craft supplies for Serena. I had hit the 50% off and bought Toy Story crayons, pencils, markers and Hello Kitty pencils and 4 pack stampers for added fun. I hit it a week ago, and hurry as these items sell fast! Use your Kohls charge and save 15% or more up to 30%. Don't have your Kohl's Charge mailer handy? Spend $75.00 or more and get FREE Shipping with using code GETFREE75. Remember to go in through Ebates and get a 4% rebate. I managed to get mine with a 30% off code for a mire $55.99! 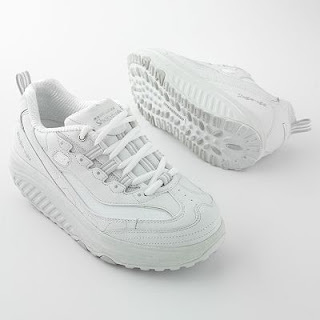 I wear mine all the time as they stabilize my bad leg because of the way I walk with them is changed. They are amazing and I needed a second pair for wearing in the house while working. From my email box today and it was meant to be shared.. If the Devil happens to bring you a situation that you cannot handle, do not attempt to resolve it. Kindly put in into the SFGTD (Something for God to Do) box where it will be addressed in MY time, not yours. Once the matter is placed into the box, do not hold on to it or remove it. Holding on or removing it will delay the resolution to your problem. If it is a situation that you think you aqree capable of handling, please consult me in prayer to be sure that you have arrived at the proper resolution. We had the gift of being invited to a lake home Kristy and Chris rented in Minnesota. Nathan, Stacey and Brody came up for a long weekend and the cousins got to meet for the first time. 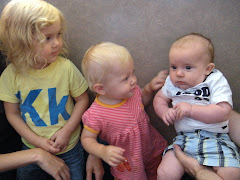 It was amazing to have my three grandchildren together and spend time with family and friends. Brody and Nate at the beach. Mahala (11 mos.) didn't leave much for Jesse to eat. Thank you to Kristy, Chris and girls for sharing your vacation and the gift of time with family and friends. Little Tikes Christmas in July Sale. Reg. $69.99 for $29.99 (73% off) Savings $40.00!!!! Reg. $139.99 Sale Price $59.99 (73% off) Savings $80.00!!!! 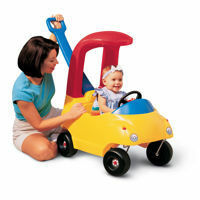 Little Tikes is offering FREE Shipping on Order of $149.99 or more. Remember to go in through Ebates and get a 3% Rebate. Who would have believed that thirteen years would fly by so fast? The youngest of the Sib set of 5 will turn 18 in August. This was the same 4 year-old the social workers gave us 9 months to return to the system because of her being unmanageable... I knew she had a chance ... I could see it in her eyes. Younkers--60% off the Clearance Yellow Dot I Hit the Jackpot! Today I stopped by Younkers (my favorite place to find name-brand clothing at bargain prices). My favorite cashier tells me that they were swamped with markdowns. Almost everything summer in the kids departments was now on Yellow dot, but yet to be marked down. Mixing and matching the bright Addidas Toddler Girl and 4-6x Girl Items and buying ahead, these items are basics and they won't date. I stocked up on 3 piece Carter pajama sets for $5.00. I even found $48.00 Columbia Little Boy Jackets for $10.00 and 2 piece Puma and Addias Jacket and Pants Set for $10.00 each. Our store had a center table filled with Calvin Klein girls bras and undies for $.99 each instead of $16.00 for a bra and 6.00 for the undies. They had thick print tights for only $.99 each and I bought out the 3 packs of Hannah Montana and High School Musical Girls Underwear for $.99 a pack for the Backpack Project. Carter Christmas baby dolls for $.99 will be donated to the Toys for Tots program and the mini Ty stuffed Christmas animals and snowmen will garnish my Christmas gifts for $.99 each. I had a blast and once again Younkers won my clearance shopping monies because of their fantastic clearance sales and quality items. With Back to School just around the corner, the Yurcek family is once again on a mission, to give foster children and other needy children a head start for school. This year Grant County Wisconsin Program will serve about 200 children with new backpacks and boxes of school supplies to differing sites throughout the county. In the past eight years nearly 5,000 children have been given a hand up for the start of school due to the generosity of others and the Yurcek kids. The Yurcek's knew what it meant to be without years earlier, when the Becca the youngest was a critically ill baby, the oldest four children started school due to the generosity of others. Several years later the Yurcek family grew when they reunited and adopted five siblings separated in foster care. The older adopted children remembered what it was like to head back to school from the homeless shelters empty handed. Ann Yurcek was speaking to a group of foster and adoptive parents and the family learned about a group of foster children in Detroit who had just received 500 empty backpacks. On the trip home the children spent the three-hour trek planning on how to raise money to help fill those backpacks, as they knew what it was to be without. In less than l0 days, the childrens’ pop cans, lemonade stand, garage sale and door-to-door flyers helped fill over 100 backpacks with supplies. It was just their way of paying it forward. Returning to Detroit, the children shared their dream of helping in Kalamazoo the next year. The foster care group gave the Yurceks 91 backpacks to help homeless children just in time for school. Backpacks for Kids was born. The project grew, and engaged the community to care. The Yurcek's Backpacks for Kids program has gained National Attention when it won the Disney All Stars Volunteer Team Award in 2004, and was featured in People Magazine in November 2005 for Small Angels, Kids Who Care. It was shared in a December 2006 Feature Story on Madison TV along with A Christmas Miracle and many news stories over the seven years of the programs existence. But the Backpack Program is far from done even though the family now lives in Lancaster, Wisconsin for the past two years. Three years ago the Yurcek family left the Backpack Program in good hands as Kalamazoo families who have helped in the program carry the mission forward along with several other programs to fulfill the needs. In Lancaster the program is growing and Backpacks for Kids is partnering with Grant County Social Services, Grant Regional Hospital, community organizations, and others to help Grant County Foster Families and families in need have new school supply stuffed backpacks for the start of school. 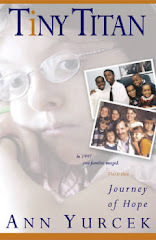 The Yurcek family story and the backpack chapter is chronicled in a 2006 published book, Tiny Titan, Journey of Hope. The story of a family who lost everything when their youngest daughter Becca was born with a severe form of Noonan Syndrome. With six children, one of them a dying baby, the family struggled against poverty, catastrophic medical bills and the despair faced by many families with terminally ill children. The Yurceks learned from the Tiny Titan to never give up and due to the Angels in their lives, they moved forward. Jim returned to school; two years of undergraduate coursework and four years of medical school were supported by delivering newspapers as a family. As the family was moving to Michigan for a general surgery residency they adopted transracially a set of five siblings. The story moves forward through the challenges of their newly adopted children’s attachment issues and the diagnoses of Fetal Alcohol Spectrum Disorders. The book is the roller coaster of the ups and downs of life of special needs families and miracles. 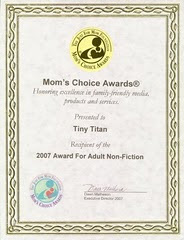 Tiny Titan, Journey of Hope by Ann Yurcek was recently honored as being selected as a two-time Award winner in the 2007 Mom’s Choice Awards. Tiny Titan, Journey of Hope was a finalist in the categories: Adult: Non-Fiction and the Your Heart Our Hands special category. This year with being gone so much, I hadn't planned on doing the backpack project, but God had other ideas. So for the 9th year, the Yurceks are back raising money, shopping for school supply bargains and engaging the community to send children in need back to school with a new backpack filled with school supplies. I managed to find Papermate Mechanical Pencils 5 ct. 2 for $.39 at Walgreens and picked up my 6 pencil sharpeners for $.29 each. Kmart has Bic Pens for $.50, and these are good quality pens. costs for a backpack and supplies. The need is great everywhere, there are backpack programs across the country. Also the schools funds are often tight, it costs very little to drop off extra pencils, crayons, glue or paper to your child's teacher and they appreciate the help keeping the classroom stocked. Teaching our kids to care, is one of the greatest gifts we can give them. Create a family project to shop for a child and drop it off in time for school. It need not cost much, use your bargain hunting skills to make a difference in the life of a needy child. We snapped this amazing picture of Four Generations of Yurceks. 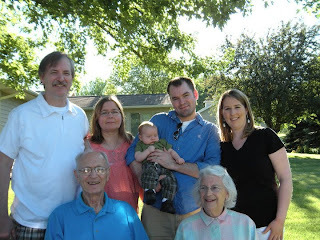 Great-Granny and Great-Grandpa Yurcek, Me (Nana) and Doc (Papa), Dad Nathan, Mom Stacey and Baby Broderick Christopher (3 months). Nathan is our oldest son and second oldest of our kids. I decided to post a few summer family fun pictures of our recent trip to Texas to care for the grands. This weekend we will be catching up with them again and we can't wait. Miss Kasja and her favorite thing to do "WEE". She can spot a park blocks away. Becca sliding with Miss Kasja at Terra Burger in Austin. Gluten-free hamburgers and fries and a WEE. Everyone was thrilled and the little girls were tired out and the big ones from playing with the wee ones. "Kettle Brand® Potato Chips (including our Kettle Brand® Baked, Organic, and Krinkle Cut™ Potato Chips) are gluten free and processed in a gluten free environment." "Our other products (Kettle Brand® Tortilla Chips, and Kettle Brand® Roaster Fresh® Nut Butters) are made in a facility separate from our potato chips, and are processed on equipment shared with ingredients that contain very small amounts of wheat. The gluten is in our Kettle Brand® Multi Grain Tortilla Chip flavor and a few of our Kettle Brand® Roaster Fresh® Trail Mixes." "We thoroughly clean our lines after each flavor run, but there is a slight potential of cross contamination with tortilla chips and nut products. For your convenience we do list all ingredients on the packaging." Couponing to Disney has a 5 a day to email companies and get coupons for products. I joined her campaign and today began emailing her 5 a day list. She posts 5 companies each day Monday through Friday on her blog making it easy. While Emailing Progresso I thanked the company for their commitment to offering some of their soups Gluten-free. eating Gluten-free. I emailed Jennie-O and received an email with a PDF of all Hormel Foods Gluten-free Products! Hormel Foods Gluten-free List for Hormel Products, Jennie-O , Chi Chi, Lloyds,, Spam Products, Dinty Moore, Valley Fresh Chunk Meats, La Victoria. Going through the list I happily discovered several shelf stable products that now have gone Gluten-free including Dinty Moore Beef and Chicken Stew. As I find lists of Gluten-free Resources I will keep them updated on my blog .